Instrumentation: 2d1. 2d1. 2d Eflat & bass cl. 2 (cfag. ad lib) - 4. 2. 2. 0 - tp - 1 (2) perc. hrp - str This arrangement of Mahler's Symphony No. 1 can be performed by a chamber orchestra of approximately 33 to 38 players. 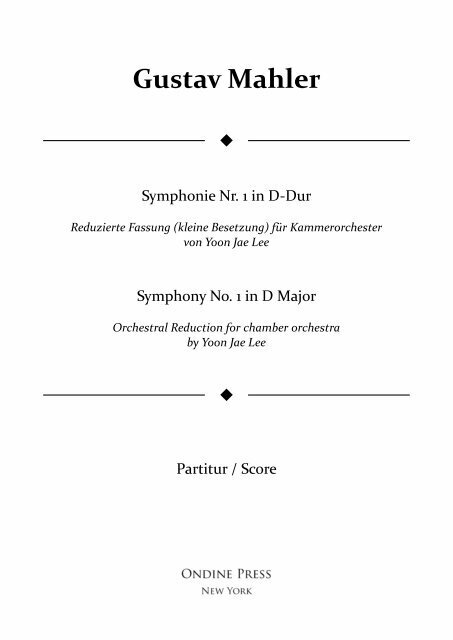 The arrangement remains very faithful to Mahler's original and is ideal for professional chamber orchestras, academic conducting programs, student conductor concerts, or whenever the full orchestral forces required for the original are not present. Performance material available for hire. Please email ondinepress@gmail.com for all rental inquiries. Flöte I Piccolo (Flöte II) Oboe I Englisch Horn (Oboe II) Clarinette I in B Bassclarinette in B (Clarinette II in B) 2 Fagotte Horn I / II in F Horn III / IV in F Violine I Violine II Viola Violoncell Contrabass Langsam. Schleppend. Wie ein Naturlaut 9 Più mosso p pp Piccolo pp pp pp dim. Englisch Horn nimmt Oboe pp 3 3 pp Bassclar. in B 3 3 pp pp pp pp IV. pp Flag. sempre ppp sempre ppp Flag. sempre ppp sempre ppp Flag. sempre ppp sempre ppp Flag. sempre ppp sempre ppp sempre ppp sempre ppp Flag. sempre ppp sempre ppp sempre pp Symphonie Nr. 1 in D-Dur I. sempre pp 1 Gustav Mahler Reduzierte Fassung (kleine Besetzung) von Yoon Jae Lee © 2012 Yoon Jae Lee (Ondine Press). Alle Rechte vorbehalten. All rights reserved. Seite 5 und 6: Fl. I 18 17 Più mosso accel. Seite 7 und 8: Fl. Ob. Cl. I (B) Bcl. (B) Fag. Hr. Seite 15 und 16: Fl. 117 I.
Seite 37 und 38: Fl. 299 297 35 Ob. Fl. Ob. Cl. I (Es) Cl. II (B) Fag. Fl. Ob. Cl. (B) Fag. Fag. II (Cfag. Fl. I Ob. I Ob. II Cl. (B) Fag. Hr. 533 525 II. nimmt Piccolo Fl.